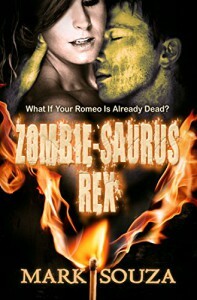 Zombie-saurus Rex was a really cool zombie story. Full of originality and fun, I cared about Rex. A lot. And I really wanted him to get a happy ending. I know, I know. He's a zombie. But he isn't like any other zombie I know, except maybe R from Warm Bodies. But Zombie-saurus Rex is completely different from Warm Bodies - in this novel, zombies can still do things like speak and go to school, but humans are leery of them, to the point where some in the military want to put them in internment camps or just go ahead and kill them all. In a sense, I could understand people's trepidation, after all, what are zombies infamous for craving? But if Rex gets to eat his calf brain for lunch and has snacks here and there (snacks he's brought with him!) then there's no reason to panic about him coming after you. He just wants to graduate high school and maybe go to college. The problem is, Rex and his mother have had to move so many times he finds himself behind in school academically sometimes, plus it's difficult to learn when you have to deal with other kids harassing you. I love Ariella! And I love that Rex does end up making a male friend, Howie. Ariella wants to be different, so much so that she goes out of her way to try to stand out from everyone else. I had forgotten she's the daughter of the Chief of Police, and so I cracked up when he knocks on Rex's door looking for her. Poor Rex had no idea! The two of them were what I thought of as the dynamic duo. I don't think there was anything Rex could have done that would've phased Ariella or made her stop liking him. Nothing. And that's the kind of friend you need at any age. Zombie-saurus Rex does an excellent job of giving you an escape from the real world while at the same time giving you food for thought (pun intended) about dealing with the presence of discrimination and adversity. I highly, highly recommend this book no matter if you're a fan of zombies or not. If you aren't a fan of them, then you will be after meeting Rex. Promise.